Shrubs or trees, to 12 m. Bark dark brown to black, smooth and flaking. Leaves persistent; petiole 0.5-1 cm; blade dark green and glossy adaxially, elliptic-lanceolate to elliptic-oblong or slightly obovate, 7-15(-17) × 3-6(-8) cm, thick, apex obtuse, abaxial surface glabrous (or sparsely pubescent when young), with 2 basilaminar glands. Inflorescences solitary flowers or 2-3-flowered cymes, borne on twigs of current season. Flowers 1.5-1.8 cm; sepals 4; petals 4; stamens 16; anthers dehiscent along their entire length; pistillate flowers with 8 staminodes; styles 4, connate for most of their lengths; ovary pubescent. Berries yellow to orange or black, not glaucous, depressed-globose, (1.5-)2-3 cm diam., glabrous (except at apex). Seeds brown, ellipsoid, ca. 1.5 cm. Flowering intermittently year-round; fruiting year-round. Disturbed ground near shores; 0-10 m; introduced; Fla.; e Asia (including Japan); w Pacific Islands; Australia. 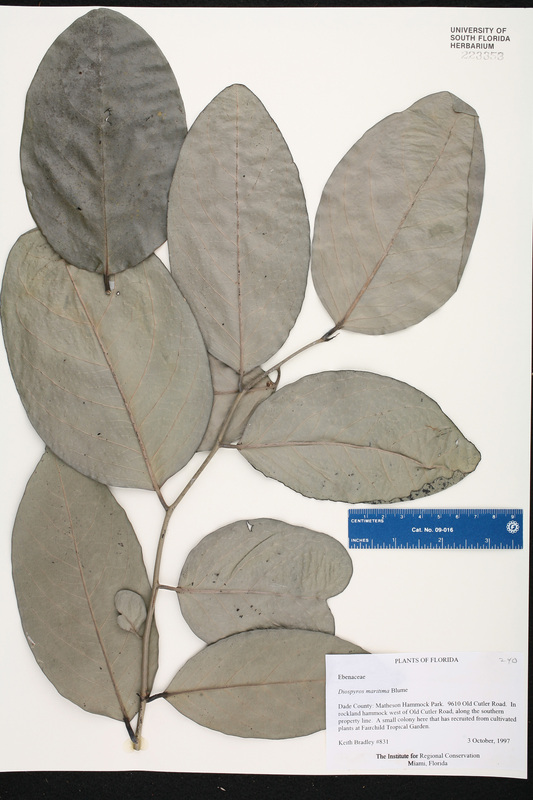 A common tree of coastal forests throughout the tropical western Pacific, Diospyros maritima is climatically well suited to seasonally dry southern Florida, with its salt-laden air, where it rarely escapes from cultivation. Although uncommon at present, it has the potential to become an established strand species, like Terminalia catappa Linnaeus or Casuarina equisetifolia Linnaeus.